The Met’s ‘Live in HD’ performances, streamed live to cinemas around the world, provide a different way of experiencing opera. The camera mercilessly captures a singer’s acting abilities – or lack thereof. It is no wonder, then, that soprano Kristine Opolais, who has garnered worldwide praise as a singing actress, is a popular star in these HD simulcasts. This time, Opolais took to the HD stage as the tragic heroine of Puccini’s Madama Butterfly – to overwhelmingly convincing effect. From her first entrance as a naive blushing bride to a shattered woman who sees no honourable or worthwile future for herself, Opolais proved once again why she may be the definitive Butterfly of her generation. Her secure, large soprano, coupled with a complete dramatic embodiment of the role is utterly gripping and convincing. The HD close-ups seem to back Opolais’ own statement that, when she is on stage, she is living a role completely, without holding back. At no point did her gaze wander to a monitor or the conductor, and at no single moment did she even show signs of being a soprano singing a taxing role. The only difficulties and suffering on display were Butterfly’s. Roberto Alagna sang an ideal Pinkerton with a warm and ringing voice, although some vocal wear and tear seemed to show occasionally. His Pinkerton oozed charm, an uncurbed puppy-like enthusiasm and plain stupidity, which made the character much more human – an unthinking product of American imperialism rather than a calculating bad guy. Dwayne Croft’s well-sung Sharpless seemed constantly painfully aware of the harmful consequences of Pinkerton’s oriental adventure, but visibly too cowardly or implicated to intervene. It rendered the character less sympathetic than usual. 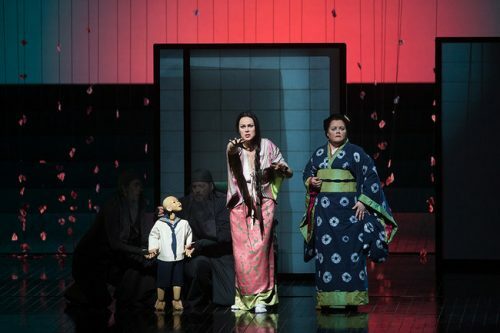 Maria Zifchak’s Suzuki was vocally convincing, although the character remained largely in the background. In spite of some moments of sloppiness, the Orchestra of the Metropolitan Opera, conducted by Karel Mark Chichon, gave a passionate and warm-blooded reading of Puccini’s orchestral score. The late Anthony Minghella’s 2006 production keeps things relatively simple and draws on elements of Japanese theatre, such as semi-invisible stage helpers in black who hold props that provide atmosphere, such as lanterns. His use of colour, especially of the blood-red that ominously surrounds a dancing geisha before the start of the opera, and that returns at its very end, has a strong dramatic effect. 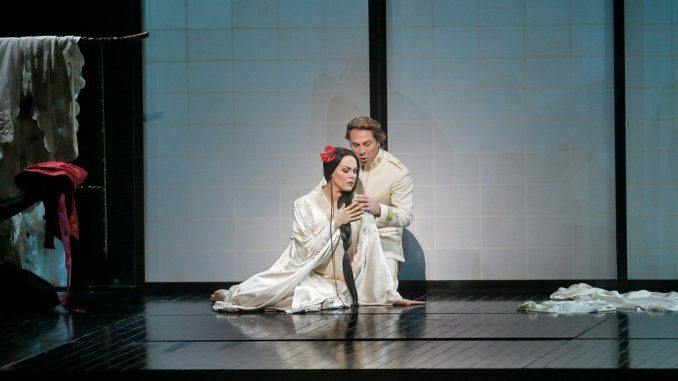 Kristine Opolais and Maria Zifchak in Madama Butterfly, (c) Marty Sohl. I was less convinced by Minghella’s choice to have Butterfly’s son played by a somewhat uncanny-looking wooden puppet. I found myself actively trying to block out the protracted fidgety movements of the pseudo-child. However limited the acting skills of children under the age of six may be, I much prefer a living child of flesh and blood who sticks to the background and only runs centre stage when the drama asks for it. Particularly disruptive to the flow of the second act was the rather unmotivated inclusion of an interval right after the ‘humming chorus’. Generally, the audience understands that Butterfly spends hours waiting for Pinkerton without having to experience something similar in the queue for the washroom. Even more destructive to the dramatic flow, however, was the decision to have an overly enthusiastic Deborah Voigt corner Opolais with a microphone as she left the stage. Rarely do these short conversations lead to any real meaningful insights. If anything, they break the magic of a performance. Luckily Opolais managed to draw the audiences back in quickly after the interval and brought the opera to a powerful, heart-rending end.